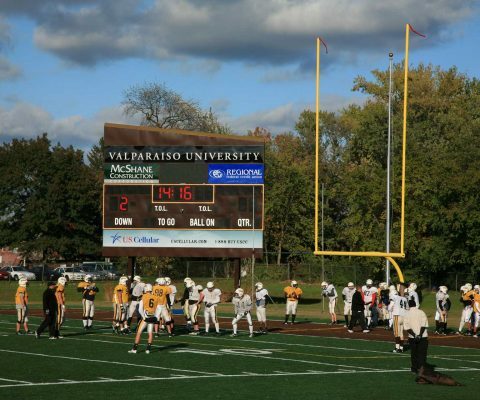 McShane Construction was selected by Valparaiso University to provide comprehensive construction services for its FITT (Football, Intramurals, Track and Tennis) Project. The project entails renovations to the existing football field including future provisions for the addition of an eight-lane track, construction of multiple tennis courts and recreational areas and the construction of a storage facility for the Athletic Department. Brown Field, located behind the ARC, is home to the Crusaders football team and is near the new courts for the men’s and women’s tennis teams. This project represents a comprehensive renovation and construction program across multiple areas of the campus. Architectural services and space planning was provided by Solomon Cordwell Buenz & Associates Inc. and SportsPLAN Studio.